After we began our tour tour rider experiment last week, I’m excited to tell you I have some excellent evidence to share that we discovered at the Hideout Block Party on Sunday just before Mavis Staples’ set. 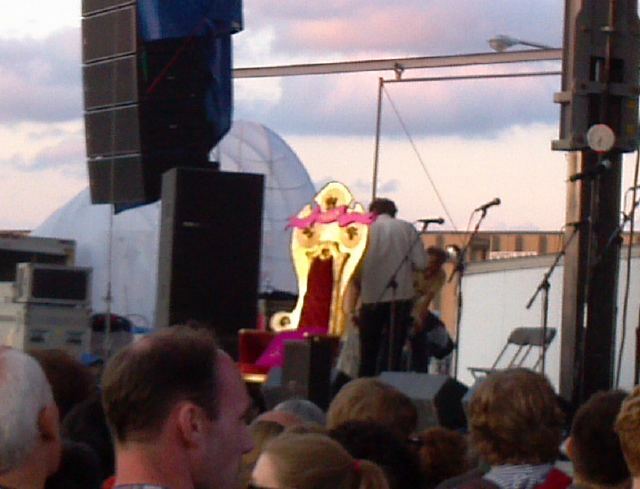 As you can see by the picture above there was a large throne waiting for Mavis Staples. It was created by the folks at the Hideout as they wanted to do everything she requested in her tour rider. And I was able to capture a piece of the action for you below in the Soundcloud player as Tim Tuten from the Hideout shares the funny tour rider story with the crowd explaining why they felt The Queen deserved her very own throne. I also have to say that it’s been a great last two months of shows, especially when it comes to experiencing ageless wonders like Staples and Tony Bennett. These two artist have really shown how they are rare gems and STILL have the power to show up today’s artist who are not even half their age! Why Did Mavis Staples Move Me? I couldn’t help but marvel at Staples during her set. There was so much soul, grace & righteous power flowing from her heart and into ours that I just stood there and soaked it up in utter glory. One of my favorite moments was during “You’re Not Alone,” the title track from her Grammy-winning album that was produce by Wilco’s Jeff Tweedy. It was the first time that I had heard the song live, or experienced Mavis Staples live, and I will never forget was it was like to watch her perform the song with fellow Chicagoan Nora O’Connor. It was as if Staples was revealing a deep part of her soul and life with us as the song unfolded. And the moment moved me so much so that I could help but continue our Twitter Experiment and tweet this message below because so many of my own thoughts and emotions that we buried down deep all of sudden came shooting up to the surface of my mind and heart. And there was so way I could push them back down or denied them. Again, only a handful of artists have every done this to me during a show and Staples is certainly on that very short list. Were you at the Hideout Block Party? Have you ever felt like this at concert? How has a artist moved you emotionally during a show? Let us know what you think and we’ll share your story during a future episode of Live Fix Radio. Great post. It seemed to me to be impossible NOT to be swept up in emotion during Mavis’ set, although it didn’t bring up any difficult emotions for me but rather joy and release (not that music hasn’t done exactly what you tweeted about to me). Yes, what I loved about both Staples’ and Bird’s set was the emotional depth and complexity of both of their performances. I found myself having so much fun watching how Bird and Staples masterfully took us all to different places emotionally while we all experienced the music together. It’s crazy how that happens. Glad you enjoyed the post and thanks for stopping by!